Marion Defense has been building a diverse line of truck bodies for the US Military and our Allies for over three decades. 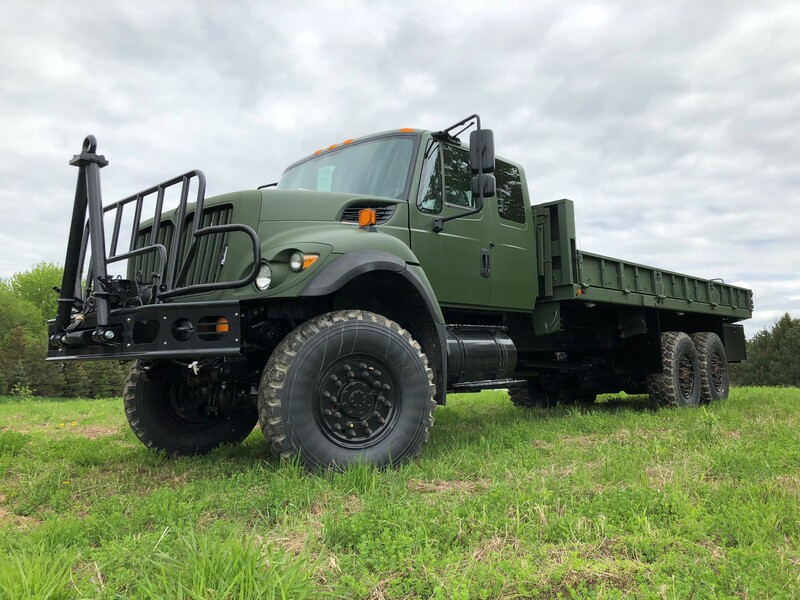 With proven platforms like the Oshkosh Heavy Expanded Mobility Tactical Truck (HEMTT) deployed globally, Marion has earned a reputation for delivering rugged and innovative vehicle components. “We have the capabilities to build exactly to your written spec, or we can help you design and build a body to meet a new requirement,” said Larry Czarnecki, Manager of Engineering at Marion. “We’ve built more than 25 different types of defense bodies for Oshkosh, BAE Systems, Mack Defense and Navistar Defense.” Some programs are steady production line contracts for hundreds of bodies like Oshkosh’s HEMTT or Navistar’s General Troop Transport (GTT) while others are limited specialty runs. “We recently completed 11 bodies for Navistar Defense that were sold to Peru.” said Czarnecki, “One was a unique mobile workshop for remote vehicle repairs that included a generator, welder, lathe, drill press and other tools. We outfitted the entire body with all the equipment, power requirements and storage systems.” Many builders would not have been willing to tackle such a short run, but Marion has a 113 year history of building specialized vehicles and custom fire apparatus. “We are comfortable looking at any spec, we are not going to be scared away by the unusual or unfamiliar,” Czarnecki continued. In addition to new body manufacturing, Marion also performs vehicle resets on used and damaged bodies. As part of complete teardowns by the OEM, Marion will receive truck bodies, disassemble them, and sandblast to remove paint. The pieces will then be fully inspected, and repaired or replaced to meet the OEM spec. Parts will be repainted and returned to the OEM for reattachment to the chassis. This extends the service of the vehicle while saving taxpayer dollars. Marion employs more than 100 American Welding Society (AWS) Qualified welders led by a Certified Welding Inspector. Their contributions, along with the rest of the design and build team has recently earned Marion the Navistar Diamond Supplier Award. Given annually to an elite group of suppliers, the Diamond Supplier Award recognizes the top half of one percent of Navistar’s global supplier network. Marion’s ability to go above and beyond Navistar’s expectations for quality, support, response time and production flexibility were key factors in earning this prestigious award. 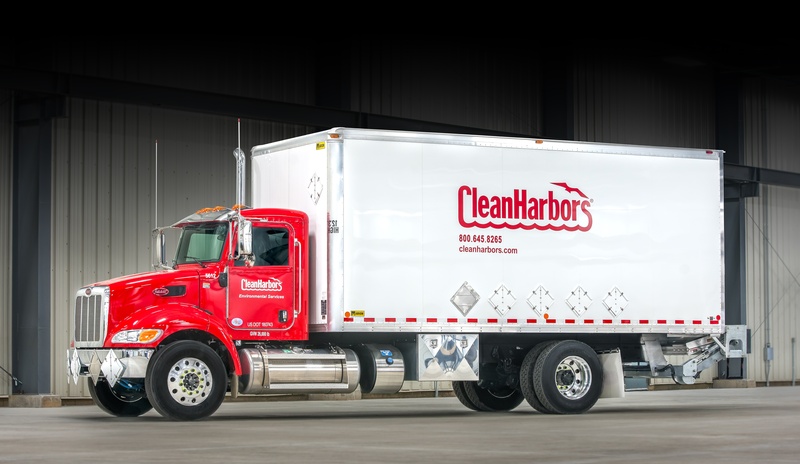 “The team at Marion is proud of what we provide our customers like Navistar. 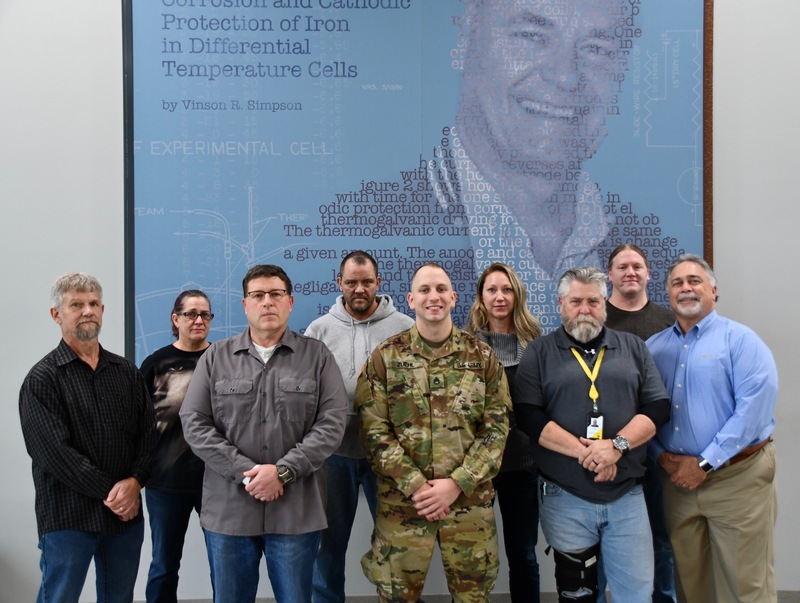 We will continue our 30+ year history supporting our US Warfighters and our Allies around the world,” said Curtis Ignacio, President & CEO at Marion. 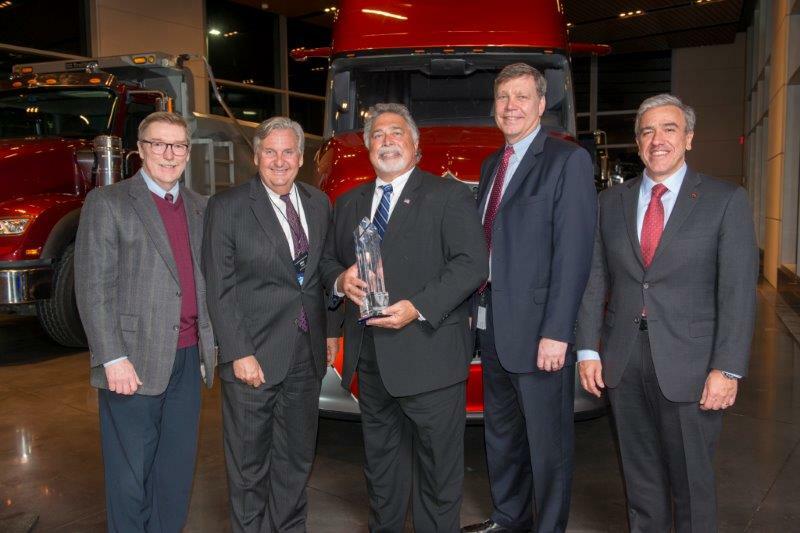 Navistar honored an elite group of suppliers the night of February 15th at their Lisle Ill headquarters. This group of 32 top performing suppliers were awarded the Navistar Diamond Supplier Award. The suppliers recognized, represent the top one half of one percent of the supply base. Marion was very proud to recently donate $5000 to the House of Hope Building Fund. This wonderful organization provides support in a variety of ways to the citizens of the Marion area. The House of HOPE has five Christian ministries that are supported through donations. These areas are: The Resale Shop (Clothes Closet), subsidizing HOPE Counseling, The Marion Food Pantry, BackPack Program and Two Transitional Apartments. The goal of this building fund is to bring all five of these ministries under one roof. The House of Hope has a major impact on the community and Marion is proud to be a continued supporter of this non-profit. The fundraising project is almost complete but donations are still needed to make this happen. Any further donations may be directed to House of HOPE. The House of HOPE is a 501 c (3), non-profit Corporation; therefore, your donation can be used as a tax deduction. 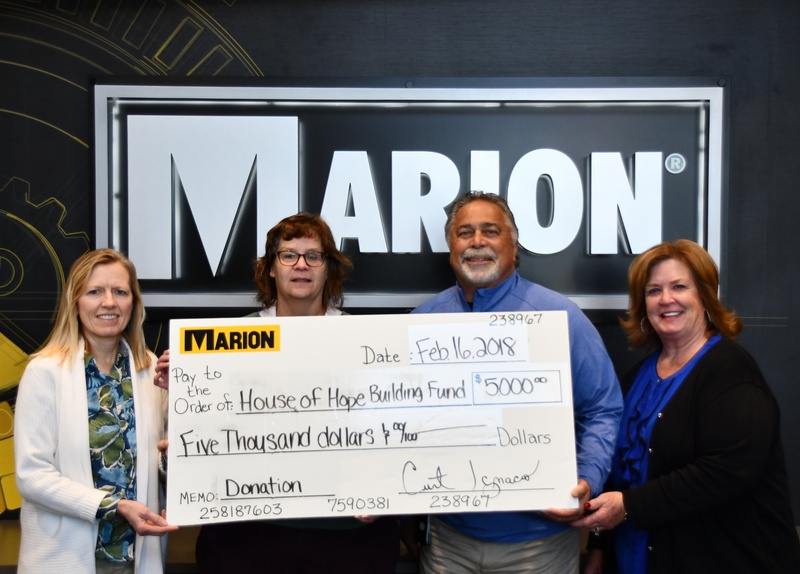 (Pictured above: Lynne Simpson - Co-Owner of Marion, Jacqueline Suehring - Chair-House of HOPE, Curt Ignacio - President of Marion, and Nancy Ignacio - Co-Owner of Marion. from this outing are sent directly to this cancer foundation. including Peterbilt and Maxon. It was a great day for a great cause! One value that stands strong in Marion Body Works’ history is to support local communities. This year has been no exception as Marion gave to the Manawa Veterans Memorial. The vision behind this Memorial was to construct a lasting tribute to the Veterans who have served and all who are serving today. Many local businesses have come together to support and honor our veterans through this project. 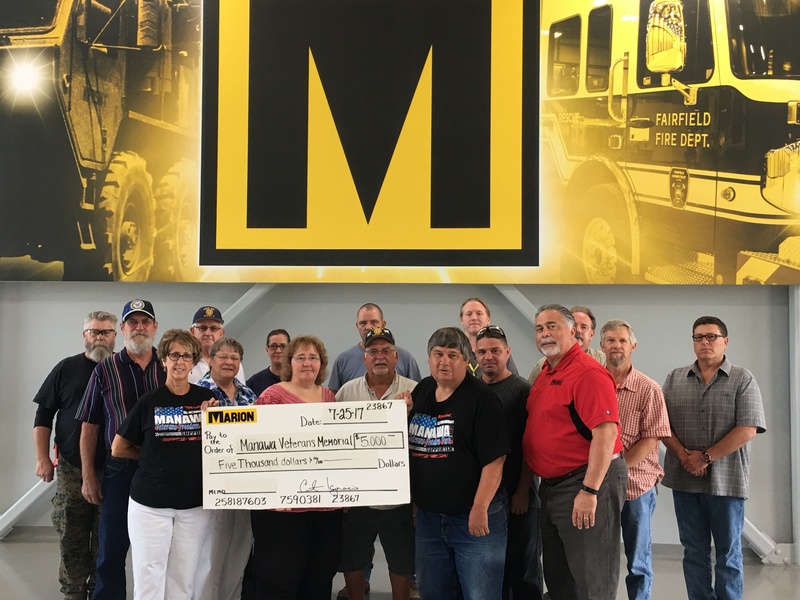 Marion Body Works is proud to be a sponsor and donated $5,000 to help fund the construction of the Freedom Park Memorial Project. Everyone at Marion takes great pride in the support of our Veterans and those that have served to help protect our freedom. The Manawa Area Veterans Freedom Park will be a lasting tribute to those who have served in the United States Armed Forces. The Memorial is intended for ANY veteran who has honorably, living or deceased or whom is currently serving. The construction of the park will be built on the shores of the beautiful Lake Manawa in Manawa, Wisconsin. The goal is to complete the Veterans side of the park and have it dedicated on Veterans Day, 2017. Marion Body Works strives to be the employer of choice in our community and beyond. One way in which we do this is by equipping the next generation with the skills and knowledge to enter the workplace after graduation. Marion provides a select group of talented interns with the chance to work in their studied field and apply a hands on approach. This year, without exception, we welcome again a very driven group of college students to MBW this summer. 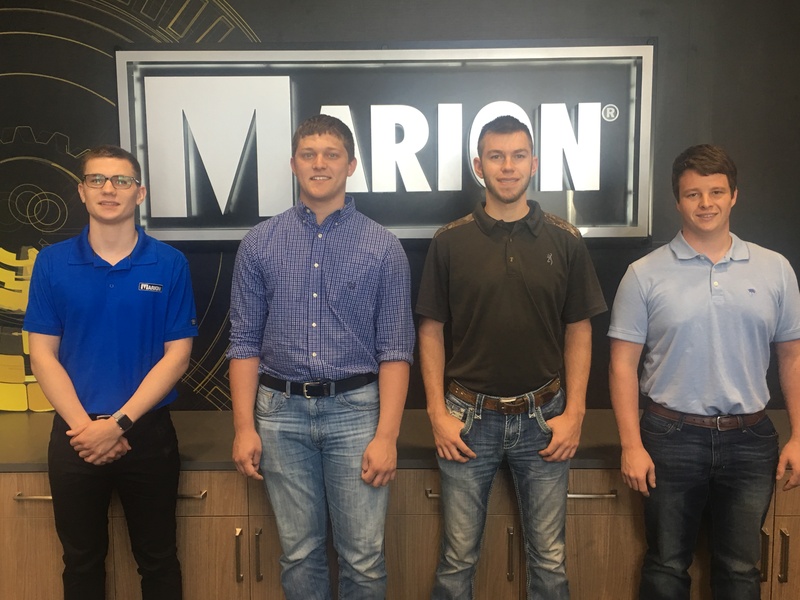 Let’s meet the Marion college interns for 2017.